A new product for 2014, this high output, low energy lighting unit is a direct replacement for the original PL lighting rig that comes with the Aqua Nano 25 aquarium, offering better light output that will penetrate right to the bottom of your aquarium. The clamp on fitting is supplied to enable simple and speedy installation. A new product for 2014, this high output, low energy lighting unit is a direct replacement for the original PL lighting rig that comes with the Aqua Nano 30 aquarium, offering better light output that will penetrate right to the bottom of your aquarium. The clamp on fitting is supplied to enable simple and speedy installation. A new product for 2014, this high output, low energy lighting tube is a direct replacement for the original supplied with the Aqua Nano 80 aquarium, offering better light output that will penetrate right to the bottom of your aquarium. The clamp on fitting is supplied to enable simple and speedy installation. Complete replacement LED lighting unit including transformer for the Xpression 17 and Xpression 21 aquarium series. The light is an original Aqua one unit and will be identical to the unit supplied with the set up from new. Comes complete and ready to use immediately in minutes. Original Aqua One LED Light Strip (not light unit) for EcoStyle 37 Aquarium. High output with low energy use and no bulbs to replace, with 12 month warranty. 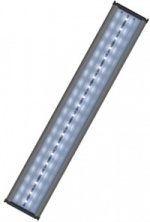 Original Aqua One LED Light Strip (not light unit) for EcoStyle 42 Aquarium. High output with low energy use and no bulbs to replace, with 12 month warranty. Original Aqua One LED Light Strip for EcoStyle 47 Aquarium. High output with low energy use and no bulbs to replace, with 12 month warranty. 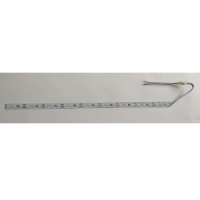 Original Aqua One LED Light Strip (not light unit) for EcoStyle 61 Aquarium. High output with low energy use and no bulbs to replace, with 12 month warranty. Original Aqua One LED Light Strip (not light unit) for EcoStyle 81 Aquarium. High output with low energy use and no bulbs to replace, with 12 month warranty. MariGlo is the very latest in LED technology for the marine aquarium and this MariGlo 120 Complete Lighting Unit is a great upgrade to many Aqua One tanks, ideal also for converting from a tropical setup. MariGlo is the very latest in LED technology for the marine aquarium and this MariGlo 60 Complete Lighting Unit is a great upgrade to many Aqua One tanks, ideal also for converting from a tropical setup. MariGlo is the very latest in LED technology for the marine aquarium and this MariGlo 90 Complete Lighting Unit is a great upgrade to many Aqua One tanks, ideal also for converting from a tropical setup.